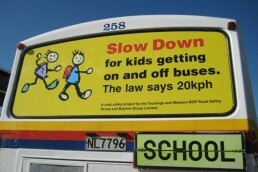 We began promoting the ‘Slow down for kids’ message for the Tauranga Joint Road Safety Committee, quite some time ago. 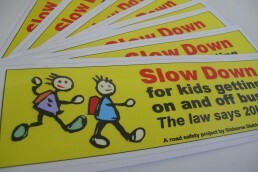 It all started with a simple child-like illustration, teamed with a succinct message. 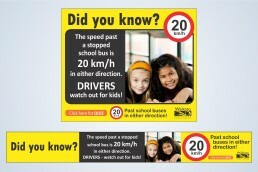 This was pasted across the backs of untold school buses throughout the Bay of Plenty and Gisborne regions; teamed with signage, newspaper adverts and promotional items – all emphasising the 20kph speed limit past school buses (in either direction). 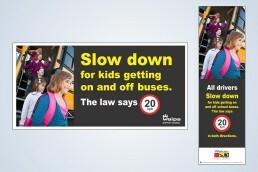 We have since refreshed ‘Slow down for kids’ with some great new images, also ideal for bus backs, print and advertising.